Deepika Patel has been passionate about foot health care from a young age. Having qualified as a Podiatrist she has been practicing for almost 14 years in South Africa, initially in Gauteng and currently in the Western Cape. She has a passion for foot health care, and dreams of a future in which foot health care can be accessible to all through the public health system. As a member of the Podiatry Association of SA (PASA) and Health Professions Council of SA (HPCSA), Deepika has kept abreast with advancements in the profession. Her passion for technology has assisted her in being able to provide laser treatment and producing digital orthotics, in order to administer the best care possible for patients. 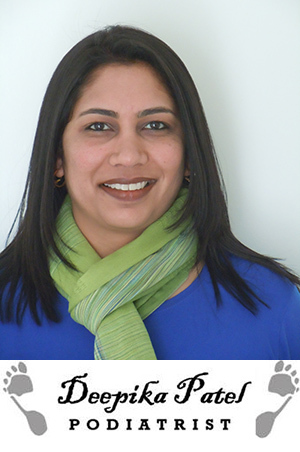 Deepika has seen and continues to consult patients of all ages (from paediatric footcare to geriatric footcare) over the years, and has a special interest in diabetic footcare and arthritic care; sports and running assessments and general foot health. Her interests also include footwear design which contributes to patients’ health, and has completed training in footwear design. As part of her outreach work, she regularly provides voluntary consultations at Wellness days for Hotel staff, and contributes to foot health care education amongst other health care practitioners. Apart from foot health care, Deepika has an interest in Yoga, and is currently a Hatha Yoga Facilitator. She completed her Yoga Teachers Training Programme at Ananda Kutir Ashrama.